Primary splenic lymphoma accounts for <1% of lymphoid malignancies., Splenomegaly may be seen in 50% of follicular lymphoma patients. The common histologies in splenic lymphomas include marginal zone lymphoma and hairy cell leukemia. Patients with splenic lymphoma can be asymptomatic or present with abdominal heaviness due to splenomegaly and constitutional symptoms. Most of the reported cases of stage I follicular lymphomas are low grade.,, Here, we are reporting a 52-year-old woman who had an incidental detection of a lesion in the spleen during evaluation for fever. A 52-year-old woman with diabetes mellitus was evaluated for fever and abdominal pain. USG abdomen showed 3 cm × 3 cm × 3.1 cm lesion in the lower pole of the spleen. Computed tomography imaging showed a 3.6 cm × 3 cm subcapsular hypodense lesion in the lower pole of the spleen and no significant lymph node enlargement in the abdomen [Figure 1]. She underwent a splenectomy, and postoperative histopathological examination revealed a spleen of 11 cm × 9 cm × 4 cm size, the surface of which showed a nodular projection. The section showed a normal splenic tissue and whitish lesion measuring 3 cm × 2.5 cm in the lower pole of the spleen. Microscopic section showed closely packed follicles composed of small lymphoid cells admixed with large cells (>15/high-power field). Immunohistochemistry showed follicle center cells to be LMO2 positive, CD20 positive, CD5 negative, and BCL2, BCL6, CD43, CD138, and MIB1 inconclusive. The microscopic and immunohistochemical findings were suggestive of follicular lymphoma Grade III [Figure 2]. Further workup including complete blood counts and renal and liver function tests was normal and was found to have an elevated LDH of 520. Hepatitis B virus (HBV) quantitative revere polymerase chain reaction (HBV qPCR) assay was high (156 IU/ml). Peripheral smear and bone marrow showed lymphocytosis only with a few scattered atypical lymphocytes. Computed tomography of the neck chest abdomen and pelvis showed no significant lymphadenopathy or organ infiltrates. Hence, the final diagnosis was non-Hodgkin's lymphoma of the spleen follicular type stage IAS Grade III with Follicular Lymphoma International Prognostic Index score of 0. She was started on chemotherapy with cyclophosphamide, doxorubicin, vincristine, and prednisone (CHOP Regimen). Rituximab not added as HBV qPCR was positive. The patient was planned for six cycles of chemotherapy and rituximab was added after four cycles once HBV qPCR became negative. Follicular lymphoma although is common in developed countries, it is less common in developing countries with as low as 3% in some reports. Follicular lymphoma commonly presents as a painless, slowly progressive lymphadenopathy. Bone marrow involvement occurs in 70% of cases and symptoms related to bone marrow dysfunction are observed in the later stages of the disease. Follicular lymphoma is the malignant counterpart of normal germinal center B-cells and is characterized by t(14; 18) translocation. Primary splenic lymphoma is defined as a lymphoma involving the spleen and/or hilar lymph nodes, in the absence of any other sites of disease involvement. Primary splenic lymphoma may present as asymptomatic splenomegaly, hematological abnormalities, or as constitutional symptoms as in our case. The most common histological varieties of primary splenic lymphoma are low-grade lymphoplasmacytic lymphoma, diffuse large B-cell lymphoma, and marginal zone lymphoma. Primary splenic follicular lymphoma is uncommon and is usually low grade., Grade III follicular lymphoma with isolated splenic involvement is extremely rare. One of the imaging characteristics that may help in differentiating primary from secondary splenic lymphoma is that usually patients with primary splenic lymphoma have a solitary lesion in the spleen. As they do not have other sites of involvement, tissue diagnosis can be obtained only from the splenic lesion. In most cases, splenectomy may be required as a diagnostic and therapeutic modality for localized splenic lymphoma., Ultrasound-guided fine-needle aspiration or core biopsy of the splenic lesion is helpful in secondary involvement by lymphoma. In our case also, the patient required a splenectomy for the diagnosis of Grade III follicular lymphoma of the spleen. These patients are worked up such as any other non-Hodgkin's lymphoma with contrast-enhanced computed tomography, positron emission tomography, and bone marrow study. Positron emission tomography is usually more sensitive particularly in patients with high-grade lymphomas. Screening for HBV with hepatitis B virus surface antigen (HBsAg) and anti-hepatitis B core antibody (anti-HBcAb) are needed in patients requiring rituximab as most of these tumors are CD20 positive. Our patient was diagnosed with Stage I Grade III follicular lymphoma of the spleen. Patients with Grade III follicular lymphoma of the spleen are usually treated with RCHOP Regimen. Since our patient had a high viral load of HBV, the patient received chemotherapy initially with CHOP only. 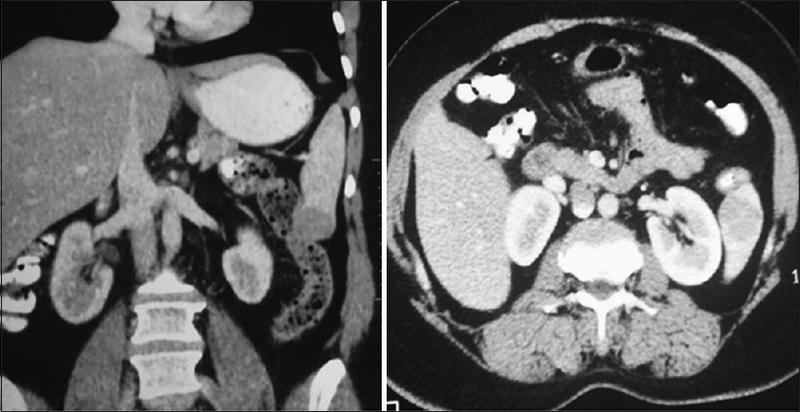 If the patient had not undergone splenectomy, the patient may need splenic radiotherapy after completion of chemotherapy. Kattepur AK, Rohith S, Shivaswamy BS, Babu R, Santhosh CS. Primary splenic lymphoma: A case report. Indian J Surg Oncol 2013;4:287-90. Mollejo M, Rodríguez-Pinilla MS, Montes-Moreno S, Algara P, Dogan A, Cigudosa JC, et al. 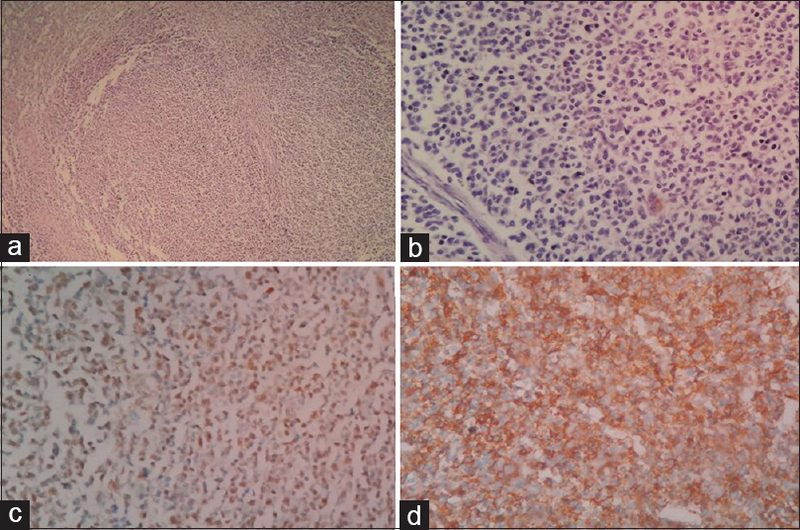 Splenic follicular lymphoma: Clinicopathologic characteristics of a series of 32 cases. Am J Surg Pathol 2009;33:730-8. Shimizu-Kohno K, Kimura Y, Kiyasu J, Miyoshi H, Yoshida M, Ichikawa R, et al. Malignant lymphoma of the spleen in Japan: A clinicopathological analysis of 115 cases. Pathol Int 2012;62:577-82. Brodsky J, Abcar A, Styler M. Splenectomy for non-Hodgkin's lymphoma. Am J Clin Oncol 1996;19:558-61. Yaqo RT, Hughson MD, Sulayvani FK, Al-Allawi NA. Malignant lymphoma in northern Iraq: A retrospective analysis of 270 cases according to the World Health Organization classification. Indian J Cancer 2011;48:446-51. Tessier DJ, Pierce RA, Brunt LM, Halpin VJ, Eagon JC, Frisella MM, et al. Laparoscopic splenectomy for splenic masses. Surg Endosc 2008;22:2062-6. Cavanna L, Artioli F, Vallisa D, Di Donato C, Bertò R, Carapezzi C, et al. Primary lymphoma of the spleen. Report of a case with diagnosis by fine-needle guided biopsy. Haematologica 1995;80:241-3. Paes FM, Kalkanis DG, Sideras PA, Serafini AN. FDG PET/CT of extranodal involvement in non-Hodgkin lymphoma and Hodgkin disease. Radiographics 2010;30:269-91. Dyson JK, Jopson L, Ng S, Lowery M, Harwood J, Waugh S, et al. Improving testing for hepatitis B before treatment with rituximab. Eur J Gastroenterol Hepatol 2016;28:1172-8. Iannitto E, Tripodo C. How I diagnose and treat splenic lymphomas. Blood 2011;117:2585-95.